Sometimes I wonder what passes through a bass' tiny brain as it joins us in our world for a minute, or as it gazes from confinement. Brainy they are, as fish go. I've had several that obviously recognized my son and me by appearance and would splash a greeting (or at least express anticipation of a meal). Through science, we've learned how fish use their acute senses to cope in their underwater world. But that doesn't remove the mystery of why they do what they do or where they go at times. But certain activity trends are discernible, particularly when we examine bass behavior through the seasons of the year. Anglers typically divide the year into four seasons, but the In-Fisherman Calendar features 10 Calendar Periods. Some of those periods can be further subdivided to explain fish behavior from a seasonal standpoint. Seasonal changes in fish behavior are more dramatic in the North than in more temperate or semitropical latitudes. But seasonal shifts in behavior and location occur throughout the species' range, and understanding these shifts can help anglers define the best angling patterns. The seasonal approach of the In-Fisherman Calendar works because it takes into account the great variation in climate within the range of the largemouth and smallmouth bass and the five other black bass species. The term "spring conditions," for example, means nothing. On March 20 in central Minnesota, lakes still were covered by two feet of ice, while the spawn was in full swing in Texas reservoirs. Meanwhile, newly hatched bass were over an inch long in the most southerly fringes of the largemouth's range. The Frozen Water Period is the longest calendar period of the year in the North Country. In Kansas reservoirs, though, this calendar period may last a month one year, then not occur at all the next. Waters in the southern third of the United States rarely or never freeze, so minimum water temperatures occur during what we've come to call the Winter Period, characterized by the coldest water temperatures of the year. At ice-out in northern lakes, bass enter the Coldwater Period, covering the rise in water temperature from annual lows to about the 50F mark. In reservoirs of the mid-South, this period may last for more than a month. In Florida, it passes quickly and may not even occur during mild winters. At about 50F, the Prespawn Period begins in northern waters and lasts until bass have mated. The Spawn Period covers egg deposition and fertilization, a short time span for fish like walleyes and stripers. But for bass and other species that guard eggs and fry, the Spawn Period may stretch to three months or even longer in Florida lakes. Of course, male and female bass differ in their involvement in spawning. After laying the last of their eggs, female bass enter the Postspawn Period while males remain in the Spawn Period until they abandon their fry. The Postspawn Period covers the short recuperative phase, followed by the Presummer Period, a transitional phase occurring as water temperatures rise toward the summer maximum. If warm conditions prevail, this period passes quickly, but it lingers under cool, overcast weather. The Summer Peak Period occurs as a body of water reaches maximum productivity in terms of plankton blooms, insect hatches, underwater weedgrowth, and swarms of fry. This dynamic period lasts just a week or so, perhaps two, but typically offers excellent fishing. The Summer Period follows, the longest period of the year for the southcentral and southern regions. Most of a fish's annual growth occurs during the Summer Period as bass feed heavily, but fishing success can be highly variable. When water temperatures begin to drop in early fall, the Postsummer Period has begun. Cooler nights cause the shift, which can signal the beginning of a peak in bass fishing. The Postsummer Period lasts until fall turnover, which typically occurs in deeper lakes and reservoirs when water temperatures have fallen into the low 60F or upper 50F range. This Turnover Period is short, lasting until water temperatures have stabilized in the low to mid-50F range. This disruption in the stability of summer typically means difficult fishing. The Coldwater Period follows turnover, as water temperatures continue to fall to annual lows. In northern waters, this leads to freeze-up, sometimes just a month or so later. And the annual cycle completes itself. Bass are cold-blooded creatures, more properly called poikilothermic, as their body temperature closely corresponds to surrounding cold water temperature. Bass behavior is strongly affected by seasonal shifts as well as immediate weather patterns. During the Frozen Water or Winter Period, largemouth and smallmouth bass display the least activity of the year. They typically hold in the deepest water they ever occupy. For at this time, the depths are slightly warmer and more stable than water near the icy surface. Precise depth depends on characteristics of the body of water. In natural lakes, bass move to deep flats or basins of moderate depth in 15 to 30 feet of water, often roaming slowly throughout a wide area. 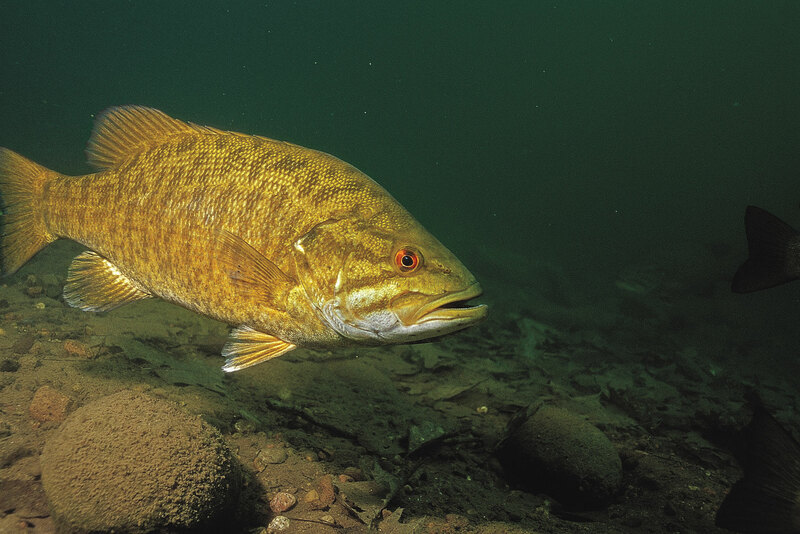 Smallmouths hold more tightly, often in discrete wintering holes. In large reservoirs, largemouths, smallmouths, and spotted bass may move even deeper, beyond 50 feet in clear waters. Bass in ice-bound waters often form large groups where they feed and move little to conserve their dwindling energy resources until spring arrives. Though not feeding, bass can be tempted with a small jig or livebait. Few ice anglers target bass, but incidental catches are common in many lakes and river backwaters. Largemouths are more active during the first few weeks after lakes first freeze, and again seem to move and perhaps feed more toward the end of the ice-bound season. In shallow lakes, declining oxygen content in bottom waters may force fish closer to the surface in late winter. In severe conditions, fish kills may occur, with the largest fish affected first. Bass in rivers that freeze seek backwaters with adequate oxygen and protection from current. In some cases, deteriorating water quality forces bass to shift location in midwinter. Because the number of good backwater habitats is limited in many rivers, large concentrations of bass can form. Where waters don't freeze, bass metabolism is low and feeding is reduced. But the dense aggregations mean that a few fish often are active enough to bite, even at water temperatures below 40F, and good catches can be made. While smallmouths favor bluff areas, sharp drop-offs, or rocky crevices, largemouths often gather along deep creek channel ledges or deep timbered areas. Versatile spotted bass may hold among rock or wood, or off deep structure like main-lake points. It's appropriate to note here that anglers who target bass in water deeper than 30 feet may find releasing their fish impossible, due to gas expansion in the air bladder, eyes, and other organs. This problem intensifies with each second a fish is held out of water or in a livewell. In extremely deep water, releasing bass can be considered wanton waste. In this regard, largemouths are most sensitive, followed by smallmouths, then spotted bass. Understanding the In-Fisherman Calendar is one basis for learning the movement and activity patterns of bass. The calendar serves as a reference, a logical basis to discuss what's happening in the fish's world. Understanding that fish species progress through distinct periods of activity that vary only in their time of onset and duration from year to year based on weather conditions allows anglers to make valid predictions about bass location and appropriate presentations. Intricacies of presentation have become a focus for bass fishing -- worm colors, crankbait diving depth, rattling lures, precision pitching, weight selection, and the like. Without a basic understanding of the seasons in the fish's world, this array of possibilities becomes baffling and then frustrating. Focus first on the nature of the beast, then presentation options will fall more clearly into place.